Amongst our members and supporters there is a huge wealth of knowledge, so we asked everyone to share their tips. Some are well tried and tested, but others are ingenious and we wonder how we hadn’t thought of them already! This advice is for rabbits who are in good body condition. Those who are old or thin may need even more care and we advise owners of such bunnies to bring them in for the winter. Keeping rabbits warm is important, because in the wild they would live in underground burrows where the temperature changes only slightly between summer and winter. By keeping them above ground we are subjecting them to extremes of temperature changes and we need to help them stay warm and dry. Damp and draughts can be deadly to bunnies at this time of year. We always recommend that rabbits are kept in pairs, and there is no nicer way to keep warm than by snuggling up to your friend. Companionship is often overlooked, and can be even more important in the winter months. Naturally, because of the dark nights we are less inclined to spend time in the garden, so we see less of our rabbits who are kept outdoors. You must make sure you check them regularly (at least 3 times a day, but more is always better) and check that the hutch or shed is not leaking, that their bed is dry, and that they always have hay and water. Cable tie a plant pot to the inside of the hutch and put the water bottle in there. Once the hutch is insulated it reduces the risk of the bottle freezing. Lift water bowls off the floor of the shed or hutch, and place a Snugglesafe underneath to stop it freezing. Wrap bottles with bubble wrap, a thermal sock or glove. Use a tarpaulin with eyelets so it can be secured in place over the hutch and run. Use silver backed beach mats to insulate the hutch and run. Put wind breaks up around the hutch and run. Line sheds to create a double wall and an extra layer of insulation. 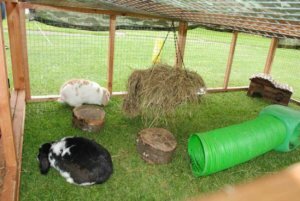 Add Perspex sheets to the front of hutches and runs to keep them weather-proof but allow the bunnies to see out. If you do this make sure there is still good ventilation, perhaps leave a small gap along the top. Add a cardboard box with a small hole to the bedroom area and fill it with dry straw or hay. Make sure bedding is kept warm and dry. Straw is warmer than hay so makes a better bedding, but nothing is warm if it’s wet. Your cleaning schedule needs to be scrupulous in the winter and don’t be stingy—make sure you provide a deep bedding of something like shavings or Megazorb under the straw. Remember, that even in bad weather rabbits will need to exercise every day. It is not acceptable to keep them locked in a hutch because you are not able to provide a protected exercise area for them, so some forward planning now may be needed. Garden sheds offer a great alternative to a traditional rabbit hutch because they can be well insulated and the rabbits are nice and dry inside as well as having room to move around. It’s also easier for the owners to feed and clean out inside a garden shed in wet weather. Exercise runs can still be attached to a shed, and can still be covered by a tarpaulin. The easiest thing to do would be to bring the hutch into an unused shed, garage (as long as the garage has a window and is not being used for a car as those exhaust fumes are very dangerous) or a conservatory. Lots of owners bring their rabbits in and keep them as house rabbits over the winter months. It’s fine to winter house rabbits and summer garden rabbits, as long as you do not embark on this and then abandon it mid-way: if you decide to do it, you will have to stick with it because it would be cruel to bring them in and let them moult their winter coat, only to put them outdoors again before spring. If you are going to do this then first of all bring them into a room with no heating and acclimatise them gradually. Remember that they may find household noises like the TV and washing machine scary so take your time. They will not be used to the artificial lights and extra ‘daylight’ either so make sure they have somewhere to hide out while they adjust. Top tip: If bringing rabbits indoors do it gradually over a period of weeks. First of all bring them into a cold, quiet room and give them plenty of places to hide. Use their own litter tray and toys so that they have a familiar smell. When to take action: By cold we mean if the temperature falls below zero; that is when insulating hutches and sheds and items such as Snugglesafe can be used for best effect—but of course lots of the tips relate to weather proofing and they can be used in wet and windy weather regardless of the temperature.